That is correct. That is really the only way you can do it. You can use ballistic calcs to get close, but shooting is the only way to get real dope. Lot more efficient method than checking a drop chart from a manufacturer, which is typically listed in inches, doing the math to convert to mil or moa clicks, making the adjustments to the scope, firing a group and then making adjustments again. I do something similar but in reverse when mounting a regular scope after getting it close with my Zero Point. I aim at the bull and shoot. Re-aim at the bull, hold the rifle steady, turn each turret until the crosshair aligns on the POI. Rancid, If I was using a laser boresight and forgive my newbness but I could just then turn my turrets to match where the laser is pointing right? no need to take shots correct? I would make one modification to the process, kinda. Rather than fire a round or 2 at the target, then adjust; i recommend a group of at least 3 rounds. If the rounds aren't grouping, no amount of turret spinning will fix the problem. I cannot tell you how many times i have seen novice shooters chasing bullet holes at the range (shoot 1 round, dope change, shoot 1 round, another dope change, shoot another round, another dope change...) because they were zeroing, pulled a shot, and doped for the pulled shot, not the good shot. What i do is fire one shot, make sure i am on paper, then fire 2 more, same point of aim. If they group, take the center of the group and adjust on that center. If one or more was a pulled shot, you'll know when you squeeze, throw that one out, and shoot another to replace it. I highly discourage the "1 shot and adjust" method unless you are quite certain of the quality of the shot. I ain't that good , I group before i adjust. And forget inches, in the real world nothing has 1-inch grip squares superimposed. If you need a grid, you're doing it wrong. You will still need to shoot a group to verify. For me I have never had a laser bore sighted rifle match the actual bullet impact. I have how ever heard of it working for some people. Just not me. And you will not know unless you fire a few rounds. This was my understanding of the usefulness of a mil/ mil quad reticle. To use it as a measuring device. . Save a lot of walking and math. For those who are math challenged like me. I've used the 2 shot method. And has been mentioned I found shooting a group to be more reliable for a general hunting rifle. In my experience, I always remember " BS "... B=Bullet POI TO S=Scope POI. I use this consistent scope turret movements for both Bore Sighting(BPOI=Bulls Eye) and Zeroing(BPOI=Actual Impact) adjustments! Simply, if the Bullet POI is at the 10o'clock position from the Bulls Eye (say 1 moa to the left & 1 moa up), I dial 1 moa elevation to the right, and 1 moa windage down, adjusting turrets as a measurement (use mil specs if appropriate). I don't hold the rifle perfectly still to visualize the change while looking through the scope. I find the measurement method easier, following the logic of turret direction, but either will get you on ZERO! Works for me, but can verify here Scope Zeroing and of course, page one Here of the OP...Christopher! Jack of Many Trades-Master of Few! One I don't know the answer to. Good write up! This Is why I always reccomend folks to get the 1/10 mil turrets to match there milliradian based reticle. The adjustments match the grid. Its also helpful to know what the value mil holds In relation to yardage. 1 mil at 100 yards = 3.6" with your 1/10 turret one click eguals. 36" 1 mil at 200 yards has a value of 7.2" with a 1/10 click value of. 72" so on and so forth. Once you get the basics you can also range targets with your reticle. The only inch value I use Is for my target heights. If you know the height of your target that can be used along with your reticle. Target height In inches divided by # of mils read x 27.78 eguals distance to target. Target height In inches divided by # of mils read x 27.78 eguals distance to target. I prefer to convert the target width or height (whatever's being measured) to distance units first (yards or meters), e.g. 18" = .5 yards. Multiply that times 1000 and you have the distance at 1 mil, e.g. 500 yards. Then divide by mils read, 500 / .8 mils = 625. Got a target size like 19"? Just go with 20, especially if the mils read is greater than 1. Frankly, if you're dealing with a target less than 18" and are reading less than .75 mils, you'd better be really good. The farther out you shoot, the harder it is to range and ballistics are increasingly not in your favor. If you're off by 25 yards at 750 yards that's probably a miss. To much there for me to keep up with lol. Ill stick to what's easy for me. Can have alot of fun with It. Chrony your loads. Run through a ballistics trajectory program. Gets you close. Nothing beats actual range time though. Always good to keep data wrote down for various shooting conditions. Do the same thing with my hand loads. I will have to agree with Rancid koolaid on this, I will go a little further on this though. I do some marksmanship instructing for some people and I have had some training from some very well known people and have been shooting mil/mil for sometime now. One of the first things that anyone will tell you is to dry fire, dry fire, dry fire. It will do nothing but help you. Some of the best shooters in the world dry fire more than they actually shoot live ammo. One of the first things I do when I get to the range is get a nice steady position built, usually in the prone with the front of the gun on bags or bipods, and a sandsock under the buttstock. I will then get straight behind the gun focusing on my body position and natural point of aim, I then relax myself and start dry firing for at least 15 minutes before loading my first round, while doing this I am focusing on my point of aim, my breathing, relaxing, body position, and trigger pull. 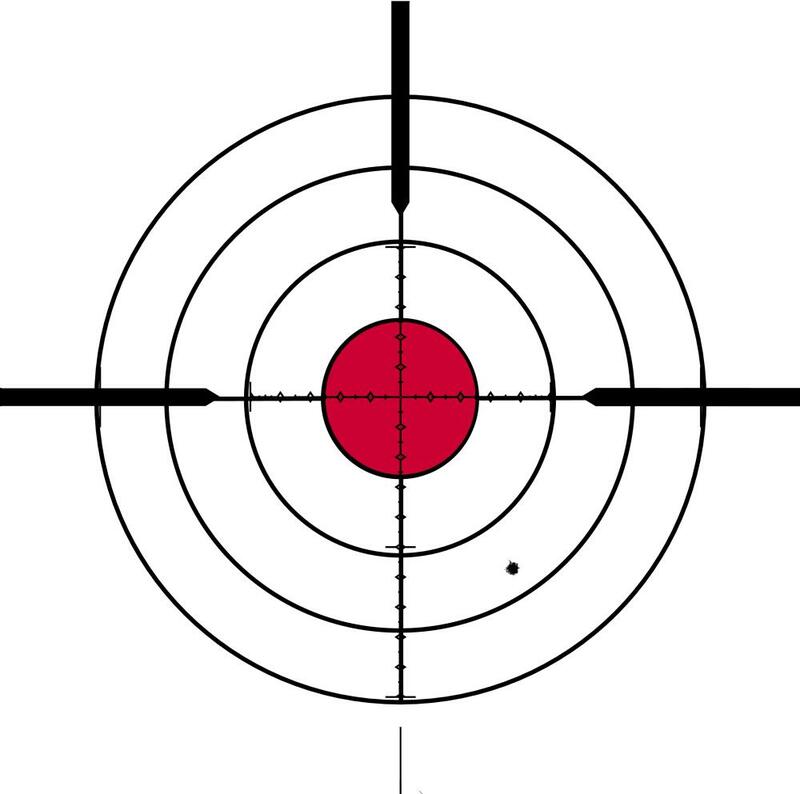 I aim my reticle at the exact point to which I will be aiming when I shoot that first round. Once everything feels just right and I am back in the groove, I will chamber my first round, these shots should be good because I've already shot them 20-30 times. One key here is the steady position of the gun, as one guy was saying about not seeing the impact exactly, with a good position and a decent scope you should always fall right back on target before the bullet impacts at distance, this should be practiced at all times. If using bipods put some forward pressure on them and take the "slack" out of them. Use your firing hand, except your firing finger and pull the gun into you. Now I will fire not 1 but 3-5 rounds not worrying about where they hit but that the group is solid. When teaching I will have students shoot at least 5 5 round groups before trying to zero, all you want here is a nice tight group. If I do not get a nice group at first I continue shooting groups until I do, sometimes taking a break and coming back to it to get the group that the particular gun should be acheiving. Then I hold the center cross hair or whatever reticle I may be using on the aiming point in which I was using, then I use it like a measuring tape and I measure the distance to that shot group. I then make corrections on the scope and shot another 3-5 round group, should be dead on at this point, maybe a minor tweak here or there until I hit the center of my group exactly where I am aiming. No point to go down range with a decent scope, 9-10 power can see a hole down range at 100 yds pretty easily. This same method works for MOA reticles or MILS, they are just units of measurement, no need to get wrapped up in what x means at y distance, just use it to measure with. I know this was a little long winded but I love to help people out with stuff like this. Thanks for listening to babble on and on. "The bullet will never lie"
Dustin ; sounds like you have a good system. I end up getting in too much of a hurry sometimes when I'm at the range. And I haven't concentrated onset fire practice. I want to get good at reading, understanding and using the mil scale reticle. Good write up, sometimes people overthink things like this. Easiest sight in session I had was when I used a mil/mil scope, took 3 rounds only because the target wasn't big enough to see where the first shot actually went. People need to remember that this is to be used on FFP or at the proper magnification for a SFP. I have shot with people a few times who when sighting in a Mil/Mil scope will still go to the target and measure how far away it is from bullseye in inches and then try to convert it into Mils in their head. Because of this I decided to do a write up on sighting in a Mil/Mil scope. It is extremely easy when done right. You start off with your blank target. You will then get a steady rest and fire your first shot off. The key here is a steady rest and slow steady trigger pull. If done right this will only take 2 shots so make sure it counts. You then squeze the trigger and let the gun do the work. Now You simply look at the target and see how much you missed by. In this case your initial shot was more than 3.5 mils to the right but not quite 4 and a little less than 6 mils low. The key here is to forget about inches or any other linear measurement. Just measure with the scope, after all that is what it was designed for. Now go ahead and make your adjustments 3.7 mils to the left and 5.7 mils up. Now reaquire your target and verify your adjusments. If done properly your next shot should be in the bullseye. This method can be used in many other circumstances also. Say you are out with some friends plinking some steel at some pretty good distances. Will you be able to measure an exact hit with it at 500 yards or more, probably not. However, when dealing with winds gusting and varying in MPH it can help a lot. You shoot and see the wind has pushed your bullet a little farther off the target than you anticipated. Instead of dialing in your windage, because the wind is varying, just measure it with your scope and hold however far off your splash in the dirt was to the side of the target in the opposite direction. It makes for very fast and very accurate adjustments/corrections in many shooting conditions. You have the equipment, use it to your advantage! I do not have the post count to upload an image of the Burris Ballistic MilDot reticle in an XTR 312 that I recently acquired and am wondering if it might be workable to ignore the absolute relationships between the ballistic elements in the reticle below the horizontal windage axis and (with practice) estimate hold over or hold under adjustments based on visual extrapolation of relative distance on the mil dot section of the vertical axis with magnification set to 12x with this rear focal plane device. Here's a hyperlink link to the ballistic Mil-Dot Reticle on the Burris website per my question in the above post. The 2-shot sight-in is another cool thing about having matching turrets/reticle, esp. with an FFP scope. is this something that i need to pay special attention to when buying a scope? i would assume that they would match, or are they known for having reticles in 1 measurement and adjustments in the other? Older scopes (as little as a few years ago) would have Mil reticles and Minute of Angle (MOA) adjustments. Of course this made sighting in a mathmatical headache. It is always best to make sure that the reticle and turret adjustments match. You can get scopes in both Mil-Mil or MOA-MOA. The SWFA SS Classic moa line of fixed power scopes have 1/4 moa adjustments. As far as I know ( admittedly not too much knowledge). All mil dot scopes are milli radian but the adjustments " turrets" may be mil or moa. As has been said. The mil/ mil is the easiest to deal with. The SWFA " mil quad reticle being very nice and about as easy as it gets from my research.